The guidebook omits a crucial detail. A big, sharp rock sticks out of the water just below and left of the hole. When the water level is low, the only viable way through is to go between the hole and the rock. As the water gets lower, this route gets narrower. And the water was very low on Friday, June 27. Whatever Shorty Burton did at Upset, it wasn’t recommended. He was piloting a commercial motor rig in June 1967, and his raft got hung up on the rock and flipped. All the tourists escaped, but Shorty’s life jacket got caught in the raft’s rigging and pinned him underwater. You can read all about it on a memorial plaque his mourners made out of a pie pan and fastened to a rock at the base of the falls. Thousands and thousands of people have successfully navigated Upset since Shorty died there, but he’s the one we all think about. John McPhee ran this rapid two years after Shorty did. “The drop-off is so precipitous where Upset begins that all we can see of it, from two hundred yards upstream, is what appears to be an agglomeration of snapping jaws; the leaping peaks of white water,” he wrote in Encounters with the Archdruid (1971). 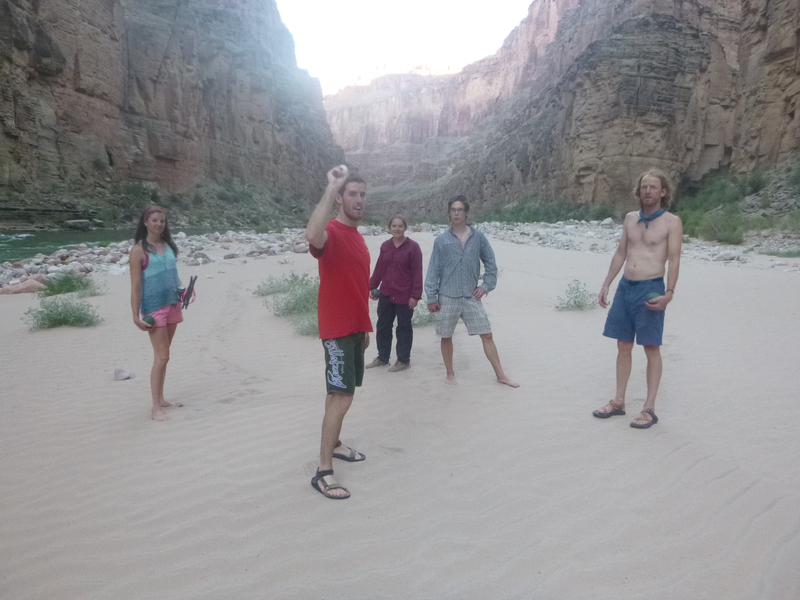 “We all got off the raft and walked to the edge of the rapid. What we saw there tended to erase the thought that men in shirtsleeves were controlling the Colorado inside a dam that was a hundred and sixty-five river miles away. They were there, and this rapid was here, thundering. We launched shortly before 9am and were soon beached above the rapid, looking at some version of the scary mess described above. We were nearly at the end of the big rapids; we had to get through this one, and Lava Falls tomorrow, so we had just two more chances to get our own pie pans. The oarsmen looked at Upset for a long time. While they were looking, a big blue commercial raft went through it without a mishap. Still, it wasn’t pretty. That’s a fair description of what it felt like. An inflatable, self-bailing raft flexes when stressed. If a wave crashes over it, the water pours out the bottom. It turns out that the best way to manage the risk of throwing yourself through one of these huge hydraulic nightmares is to compromise with it. We all got through Upset fine – wet and shot through with adrenaline, but fine. As we pulled away, I saw something black floating up ahead. I tried to snag it with a canoe paddle, but it sank before I could get to it. I did see that it was someone’s bra from the commercial raft. It headed into the depths to be discovered again, but who knows where or when. The rest of the day was quiet. It was late morning when we finished the rapid and we had to make 16 more miles, so we rowed hard and steady. The Muav Gorge Limestone was gray near the waterline, where floods scoured it, and red farther up, where nothing stopped the oxides from making a stain. We passed Mount Sinyella on river left, on the reservation of the Havasupai Indian Nation. 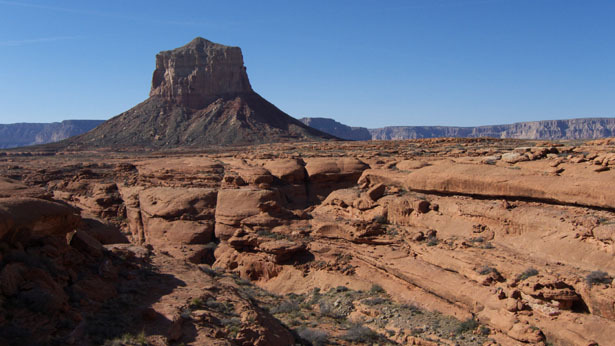 Sinyella is a sandstone pinnacle that sticks up 1,200 feet above the Matkatamiba Mesa. 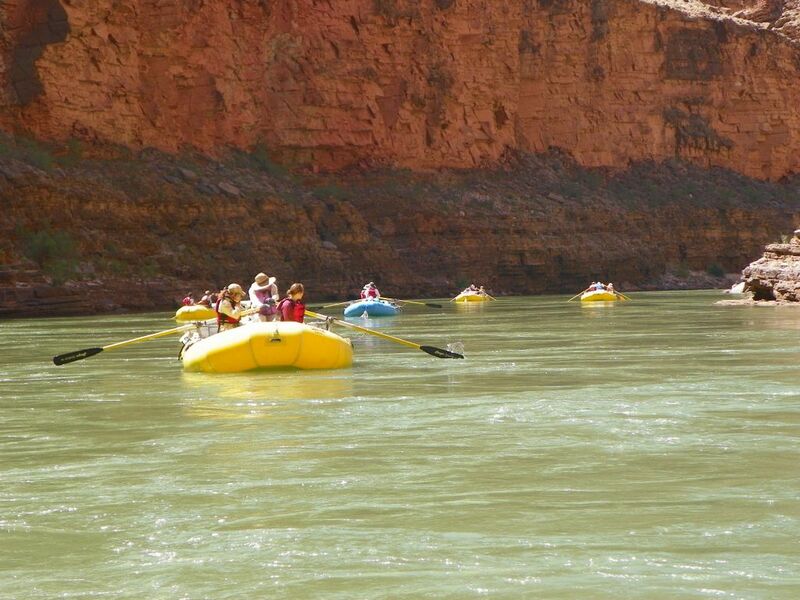 The Supai legends say that it is the center of the universe. We didn’t get the best view of the mountain from the river, but photos taken from the mesa make it easier to understand why they would reach that conclusion. It dominates everything. 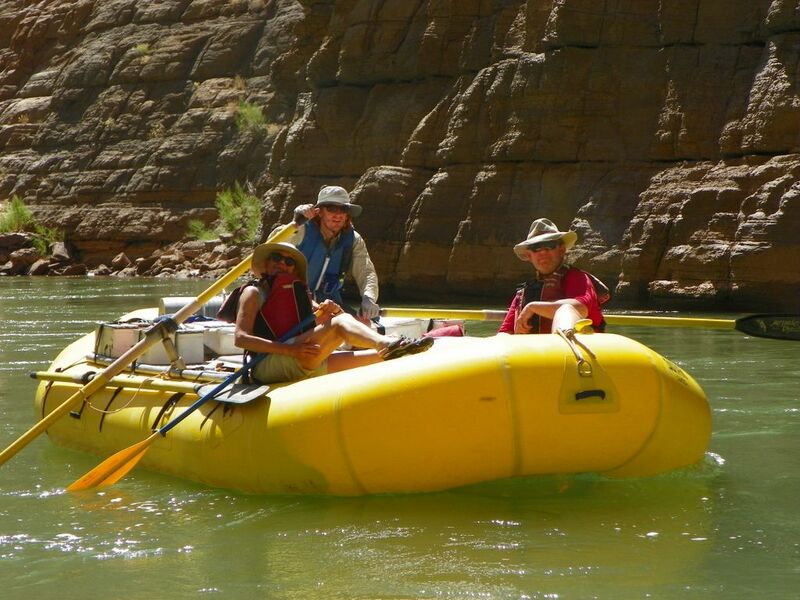 Havasau Canyon is one of the A-list tourist attractions in Grand Canyon, but Pete and Rod advised us to skip it. In the middle of the day, it was likely to be crowded by commercial rafters. 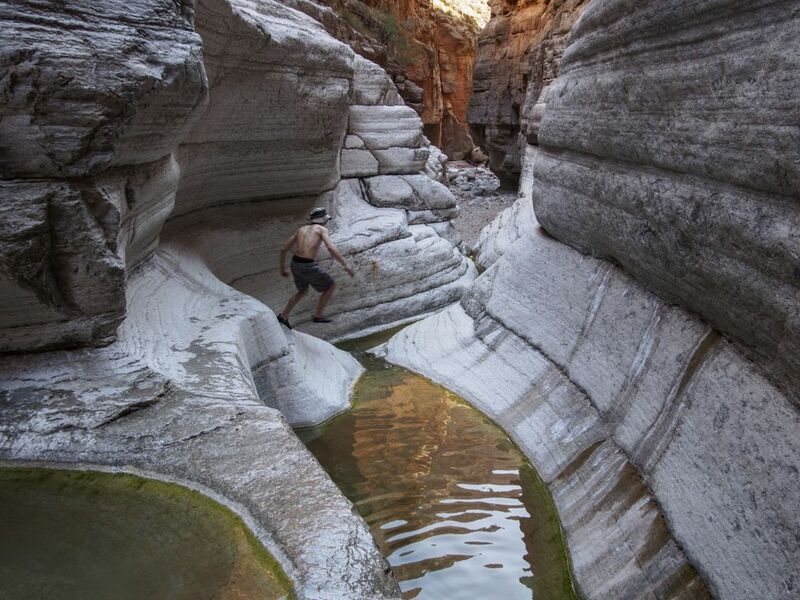 It was an eight-mile hike from the river to the biggest waterfall, and in the lower parts of the canyon, flooding had destroyed many of the travertine dams and large vegetation that had given the place its famous otherworldly character. 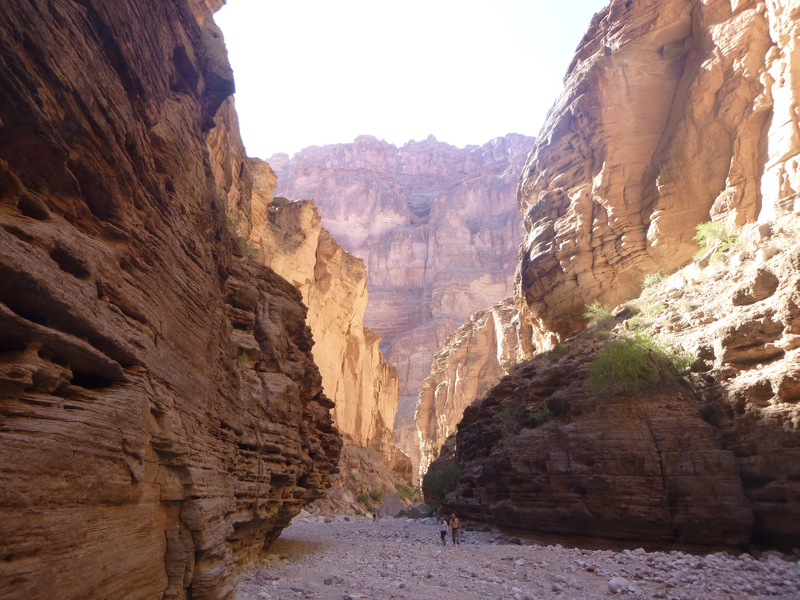 Also, Rod informed us, residents of the village of Supai pour their treated sewage into the creek – which might or might not be a problem, depending on how well their sewage plant was working that day. I made another mental note to come back. Those notes were piling up. 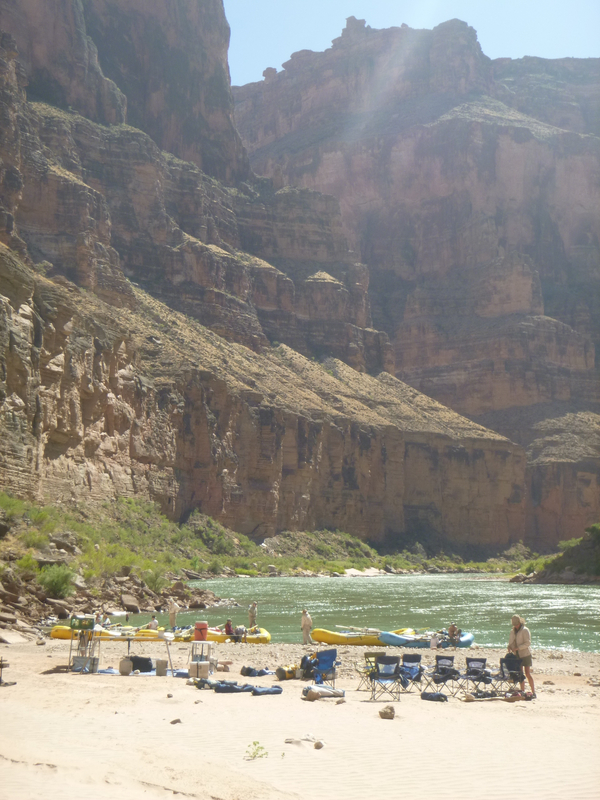 We pulled over for lunch on river left, in a sandy alcove just big enough to throw the boats into shade. The group sat on the sand and ate and chatted happily. Feeling crowded, I picked my way a few yards downstream to another sandbank and looked out, thinking about nothing really. Then a hummingbird came up to check out my bright red shirt. She hovered two feet away from me, did a slow 360-degree scan of my torso and, finding no nectar, buzzed away. Pedro gave me the oars after lunch and I slogged along, rowing steadily in the heat. 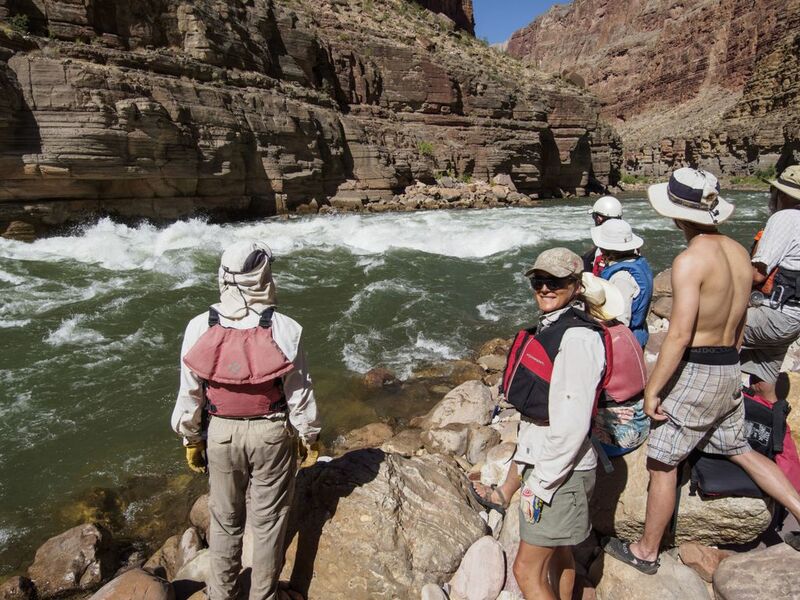 The water was flat except for two small rapids, so we had lots of time to look out and see what had changed. The plants were different: for the first time, I saw spiny Ocotillo and the always-forlorn looking creosote bush, a sure sign that we were moving deeper into low desert. Today we also saw the first sign of basalt, a black volcanic rock deposited as lava flows. As the afternoon wore on, we saw more and more of it. We pulled into National Canyon around 3pm. 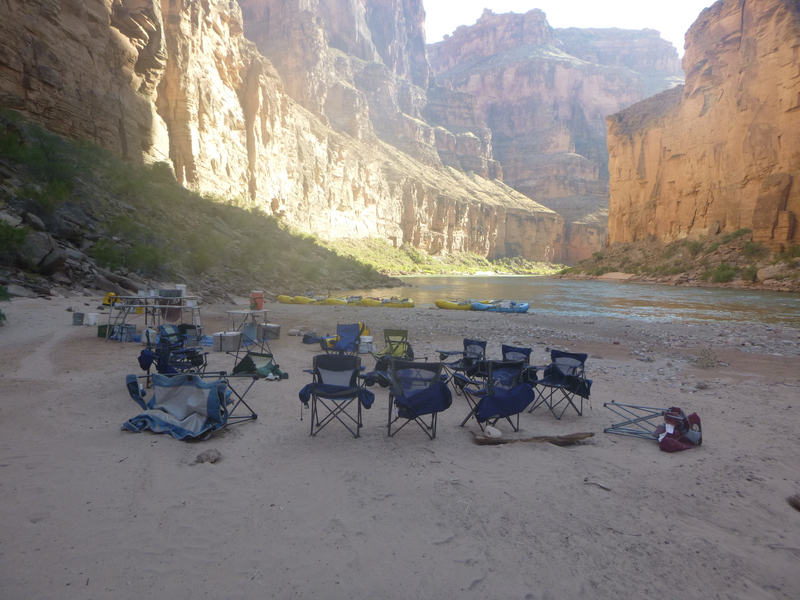 Our campsite was a massive debris fan at the base of the canyon. The afternoon wind was strong enough to kick up lots of sand, and it took us a while to find a place to camp on this big, flat beach because the high-water mark was a fair distance away from the shore. The river rises and falls as the operators of Glen Canyon Dam release more or less water for the electrical turbines; but Glen Canyon is 175 miles upstream from National, so a big water release at 9am on Monday might reach this spot 36 hours later and, of course, no one had any way to predict how big the surge will be, except to inspect all the wet spots. We ended up lugging the camp about 30 yards up from the shore, then re-tying the rafts in a cove of deeper water downstream so they wouldn’t be stranded if the water rose and fell. It was a lot of work, and it was very hot, and I tried to be a good soldier and do as I was told – but by the time the work was done, I badly needed a break. 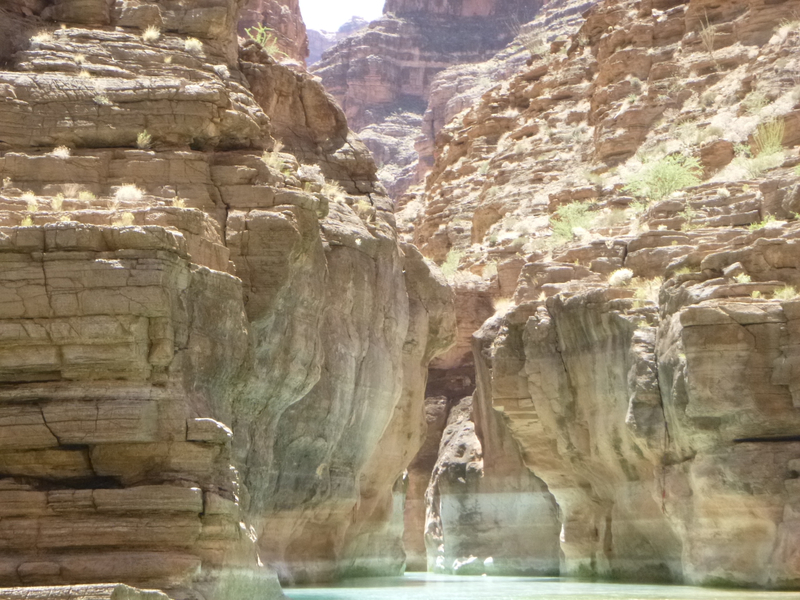 National Canyon is spectacular, in a blasted-out kind of way. A huge flash flood tore through here in July 2012, ripping out all the trees and scouring the cliff walls, and the debris layer at the mouth of the canyon might be 15 feet thick. Tania and I stumbled up it until we found some shade, then tried to disappear into the rocks. We hadn’t had much time alone together in the last few weeks, and we were both homesick, although the relentless jaw-dropping picture show usually crowded out most thoughts of domestic comforts. It was good to rest together for a few minutes in the quiet. I learned later that more energetic hikers (such as Lukas, in the top photo) continued up the canyon until they found running water and pools big enough to bathe in. 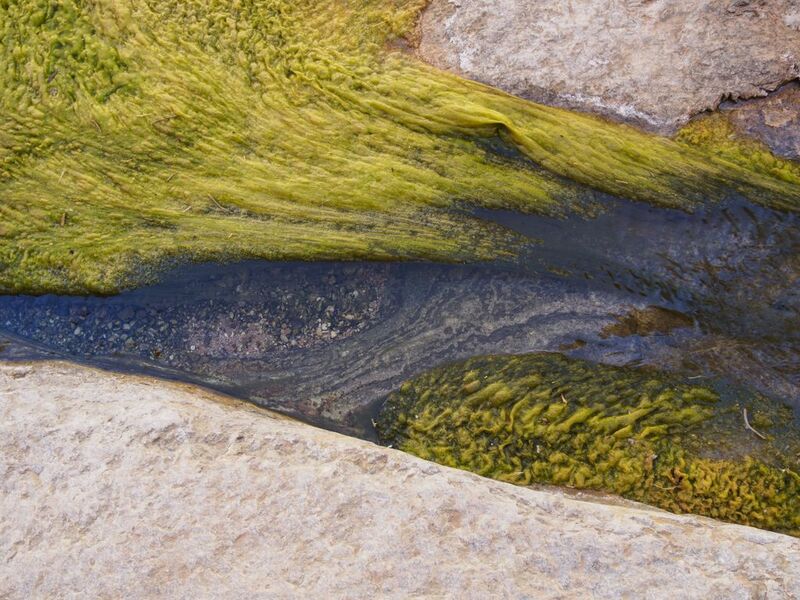 The photos of Lukas, and of the algae at left, were taken by Jim Kirchner. Tania and I chose to go back to camp and bathe in the river – the water was still bracing, but also several degrees warmer than it had been at the beginning of the trip. Then it was time to help Chuck purify another day’s worth of water. We made 15 gallons today, compared with 20 yesterday. By the time we were done, shade from the cliffs on river right had covered the beach, and it was a lot easier to move around. The younger folks (Jai, Tim, Lukas, Baer, and Pedro) broke out the bocci balls and had a long session on the beach as the light faded. I attacked my notebook, and the others sat around eating kippers and drinking while Rod slowly made delicious lasagna in the Dutch ovens. Everyone was thinking about tomorrow, when we had to run Lava Falls.